Claire’s birthday just passed and every year we have a good time creating something unique; just for her. 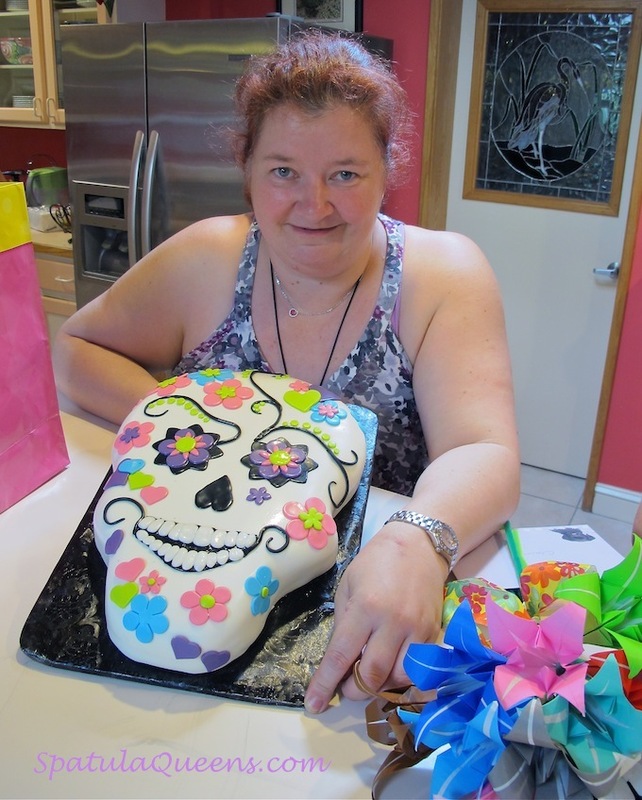 Last year, we made this cake, a sort of take on Day of the Dead, because she’s into skulls. 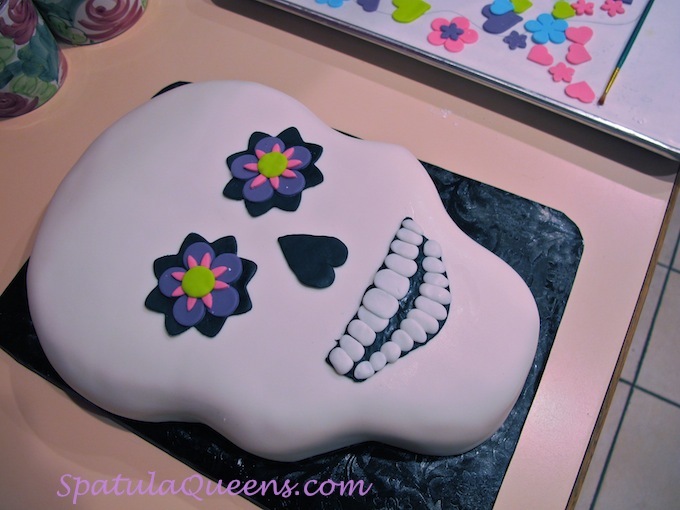 This blog wasn’t in the picture at the time, but I photograph all my cakes and save the patterns, so recreating instructions to make a skull cake was easy. The decorations were made with colored fondant and the cake was pound cake, which we find easier to sculpt than a lighter sponge cake. You can cover it with buttercream or rolled fondant – I used fondant and unless you make fondant-covered cakes frequently, I suggest using pre-made fondant. For this cake and decorations, about two pounds should be plenty. 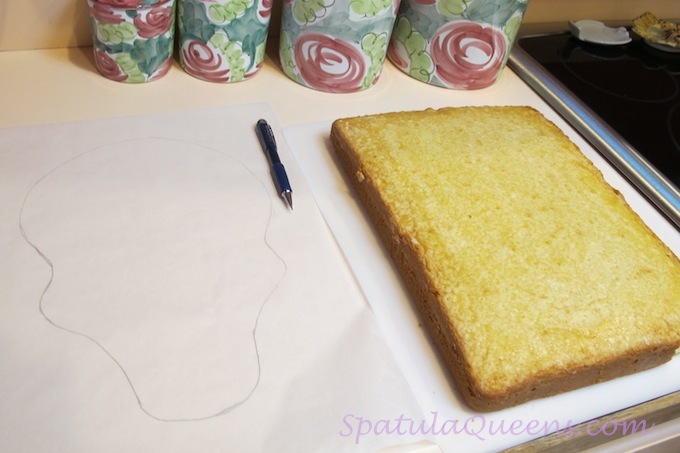 Start with a 9×13 cake of your choice (see Basics: Pound Cake for the recipe we use) and a pattern sketched on parchment paper. 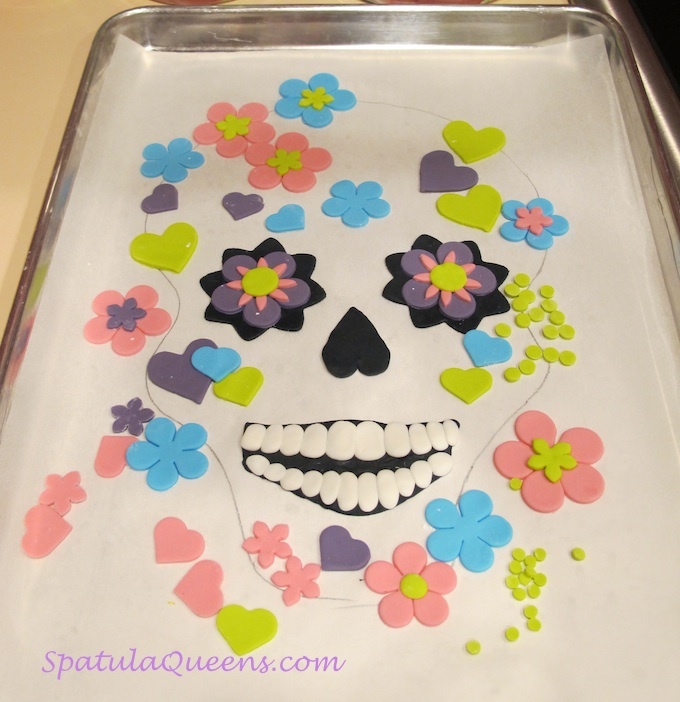 This one is freehand drawn, but you can download our skull cake pattern if you want. It is 11×14 inches but you can scale it up by printing it out and using it to sketch out a slightly larger size on a piece of parchment paper. 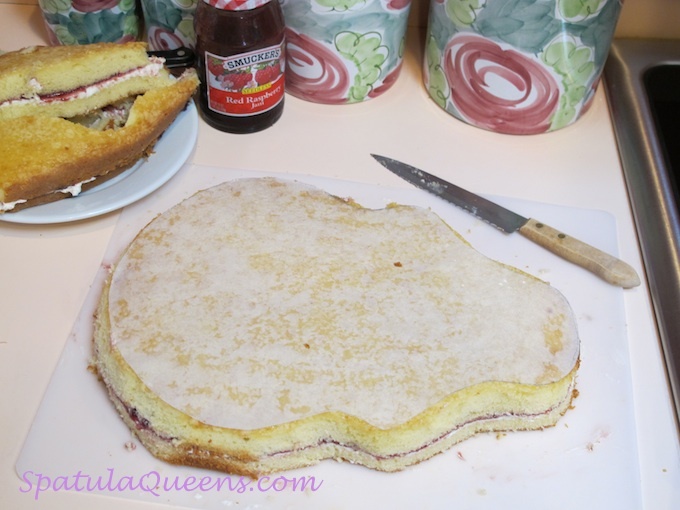 Test the pattern out to make sure it fits your cake, before you split into layers. It is best to have at least a half to one inch of cake all the way around the pattern – this gives you room to shape and sculpt. 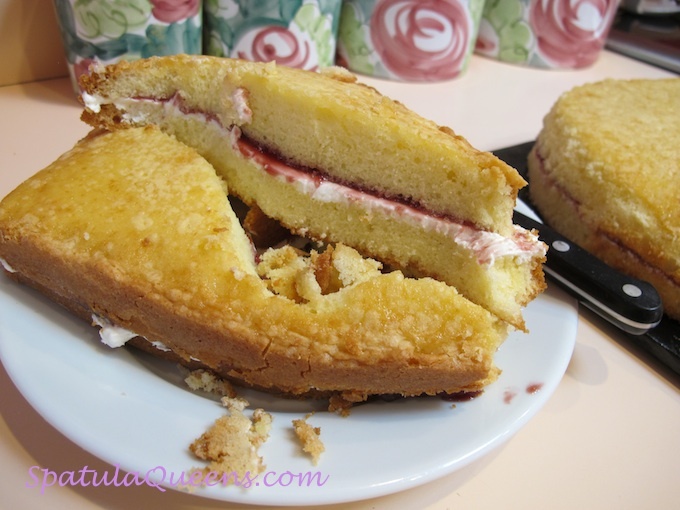 Split the cake – a long knife or cake splitter works (our stand-by is the Wilton cake splitter) – frost and fill. Now you are ready to cut. Cut about one inch from the pattern; this gives room to round the edges. Now trim a little bit at a time until you have your desired effect – nice rounded edges. You can frost the cake with buttercream or cover it with rolled fondant. There are many instructions for covering a cake with rolled fondant, out on the web and we promise to post Fondant 101 instructions on this blog very soon. Save those scraps; you can freeze them and use later in a trifle – fat chance – they never make it to the freezer around here. 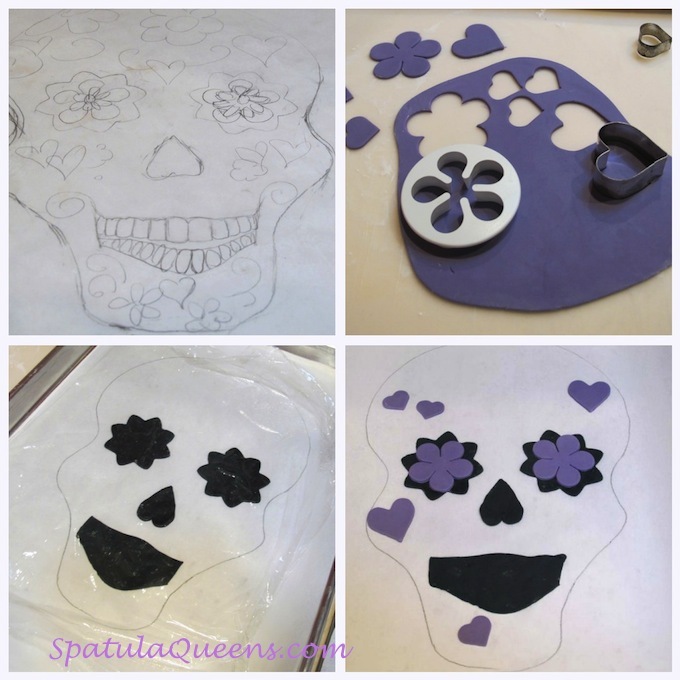 Next, sketch out your design – again, we freehanded this, using Day of the Dead themes as our inspiration. Color small balls of fondant with your chosen colors – you don’t need much. With your pattern on a sheet pan, start creating your design. 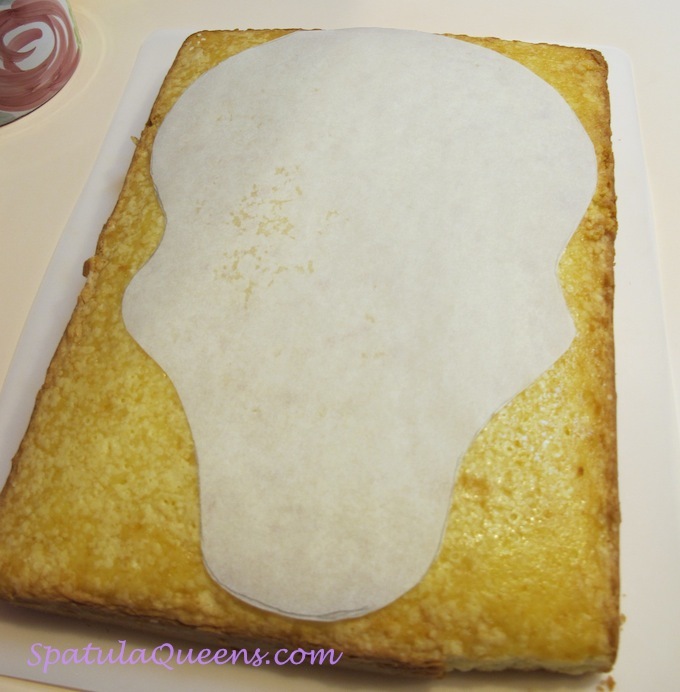 Keep the fondant cutouts covered with plastic wrap as you work, so it doesn’t dry out. I created the teeth by rolling small balls of white fondant into oblong shapes, then flattening them between my fingers. 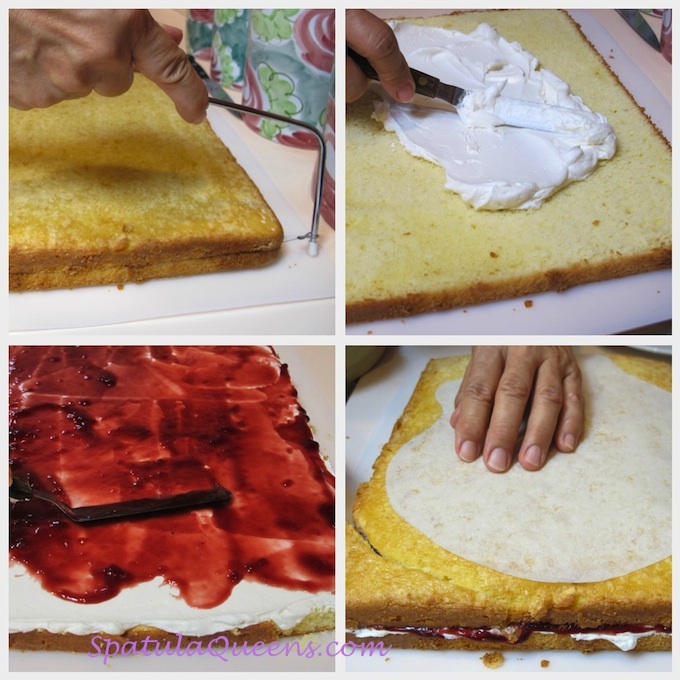 Once you have your decorations cut out, you can cover the entire pan with plastic wrap and freeze it until you are really to apply them to your cake. When your cake is ready, apply the decorations quickly; they are quite easy to lift and place if just out of the freezer. As they thaw, they will become very shiny and sticky. Don’t worry – in about an hour, they will lose that sticky sheen. And here it is – with our birthday girl. Anna…I love it. I didn’t know you were so talented. I have been diving with you (with Brad and Mary Brown) and you are so knowledge able about fish and diving, and photography….and now baking too. 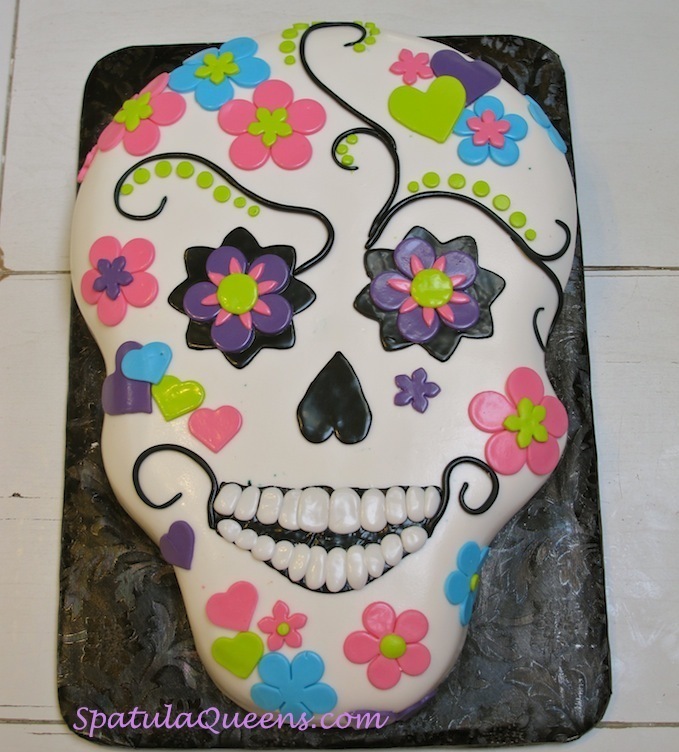 I love the day of the dead and this cake is amazing.